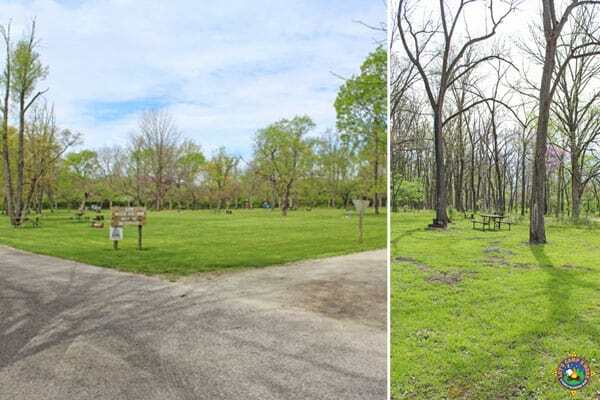 Here is a review of Kickapoo State Park and Campground near Oakwood, Illinois. Last weekend we ventured down to Kickapoo State Park. We chose it because it is home to the only National Scenic River in Illinois and it has great mountain biking trails. 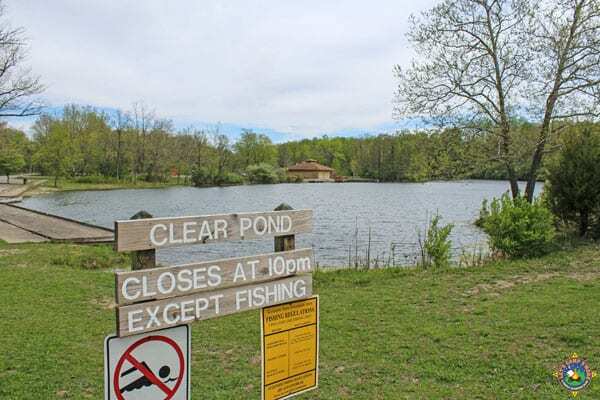 This state recreation area is popular due to it’s proximity to I-74 and it’s deep fishing lakes and ponds. It’s located near the Illinois-Indiana border. Within the park is Brian Plawer Campground. 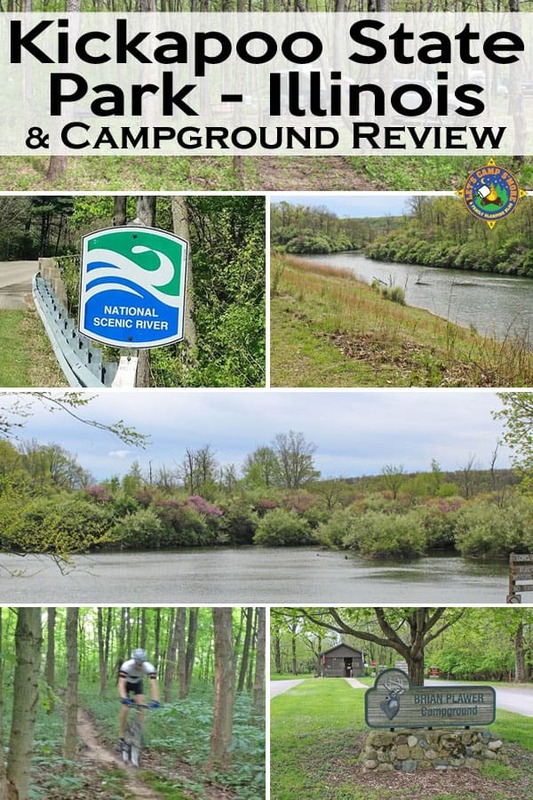 The campground has 184 sites, half of which are electric RV sites. 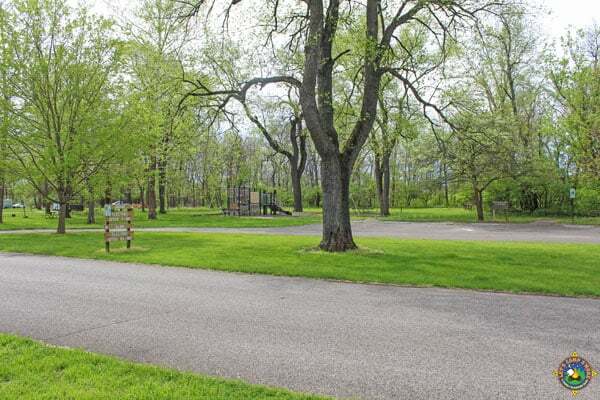 The campground is divided into three areas, one of which is a tent area. That tent area and one of the RV areas are located along a ridge over Long Lake. Most of the tent sites are in a large grassy area. There is a row of walk on sites that are wooded. 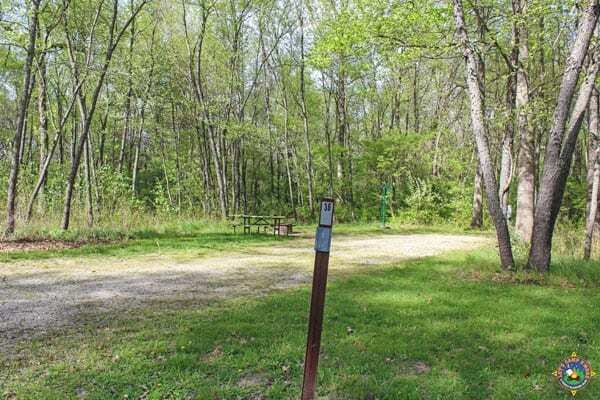 The RV sites have a flat gravel driveway, an electrical post, a fire ring, picnic table, and lantern hook. Sites are close along inner loops, but more spread out along the outside of each loop. Many sites are wooded. 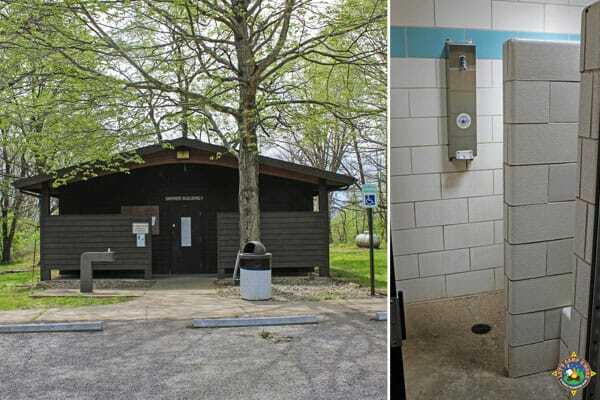 There are two bathhouses in the campground. Each side has 2 toilet and 2 shower stalls. We visited the 3rd week of April and the water was on the cool side. A lady who camps there frequently said they are plenty warm when the season kicks into gear. 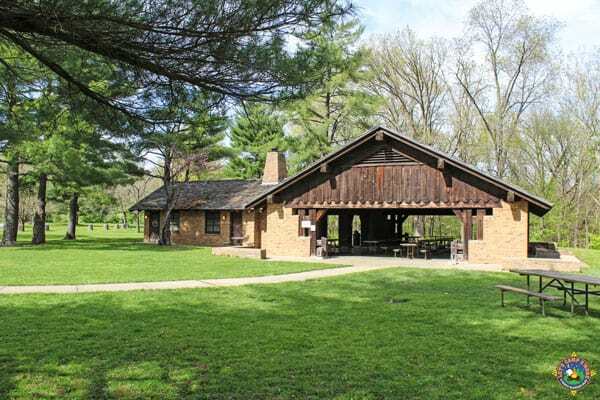 As with most Illinois state parks, these are older facilities. Other amenities include a large playground, an amphitheater, and dump station. There weren’t many campers when we were there, so the campground was quiet and dark. There’s some freeway noise and an occasional train, but nothing that is bothersome. 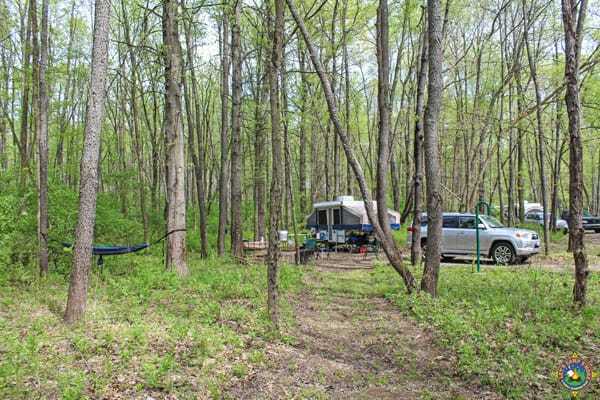 We recommend this campground, especially to travelers who are passing through the area. 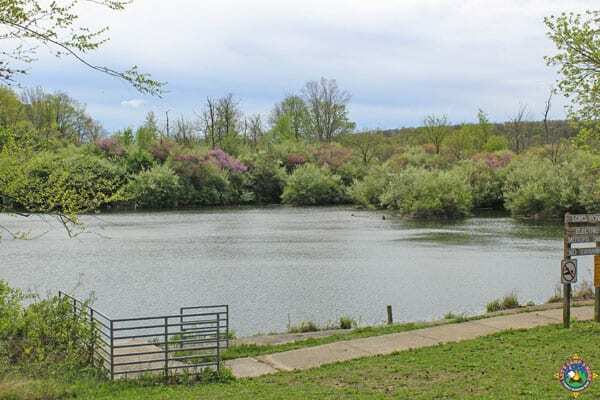 There are miles of wooded hiking trails, many with spots overlooking lakes and ponds. These deep lakes are old mining pits that are great for fishing. There are fishing piers and boat launches. A central concessions area has a snack bar and restaurant. Kayak and canoe rentals are available. You can take a trip down the nearby scenic Middle Fork Branch of the Vermillion River. Numerous shelters throughout the park that can be reserved, including the large pavilion pictured below. There are fields and playgrounds throughout the park too. There are around a dozen mountain bike trails that interlock with each other in the northeast side of the park. You actually have to leave the park to reach them. They are pretty decent trails considering it’s the Midwest. We saw a lot of road bike groups biking around the roads within the park. Kickapoo State Park is a beautiful park with a little something for everyone. We will definitely visit again. Get more information about Kickapoo State Park here.